Knowing the story behind Monsanto's stock history reveals some clues about potential future successes. Agriculture has existed for millennia, and advances in agricultural practices and technology have helped feed an exploding population. Monsanto (NYSE:MON) has been around since the beginning of the 20th century, but its shift toward focusing largely on agricultural productivity has been a gradual one. 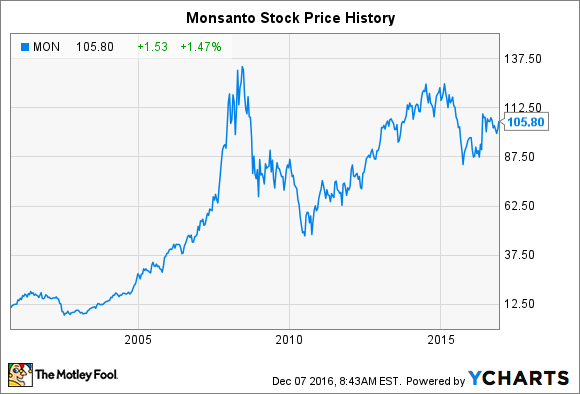 The history of the current iteration of Monsanto stock goes back only to 2000, but since then, it has produced strong returns for shareholders. Below, we'll look at how Monsanto has evolved over time and what could lie ahead for the ag specialist. Before the chart above begins, Monsanto had a long history. Monsanto was founded in 1901, and saccharine was its first product. By 1945, however, Monsanto had started producing and marketing agricultural chemicals, and the company created its agricultural division in 1960. Various herbicides came onto the market in the ensuing decades, and cell biology and molecular biology research also guided Monsanto forward. With the opening of the company's Life Sciences Research Center in 1984, Monsanto moved forward into biotechnology, and various trials led to products starting in the mid-1990s. In 1999, Monsanto entered into a merger agreement with Pharmacia & Upjohn, Inc., with the surviving company being named Pharmacia. The merger closed in early 2000, but by late 2000, the combined company separated out its agricultural operations and did an IPO of the new Monsanto, offering 15% of the unit's shares. In 2002, the company followed up with a full spinoff of Monsanto, and Pfizer acquired Pharmacia shortly thereafter. Since 2000, Monsanto's stock has followed a familiar path. The bear market of 2000-2002 kept the stock from making much headway in its first years following its IPO, but the stock then exploded higher during the 2000s. During that period, Monsanto continued making progress in what has become some of its most important products. For instance, the Roundup Ready trait helped promote cross-selling of the company's Roundup herbicide line, while the Processor Preferred trait was designed with the idea of making ethanol production from corn more efficient. Other products provided insect protection, higher yields, healthier nutritional characteristics, and extended growing season capabilities. A commodities boom also raised interest in agriculture and gave farmers more financial capacity to adopt new technology. During the financial crisis, Monsanto shares suffered a setback along with many of its peers and companies throughout the stock market. Commodities markets were extremely volatile, with a lot of uncertainty about how global economies would respond to financial turmoil. Some investors grew increasingly concerned about Monsanto's reputation in leading agricultural biotechnology as well. During the early 2010s, ag markets regained their strength, and Monsanto benefited from the favorable cycle as well. Relatively high prices for key crops gave agricultural professionals the funds they needed to seek out crop-enhancing products, and Monsanto's success enabled it to command considerable market share in key niches in agriculture. Along the way, Monsanto continued to generate controversy. A world health body declared that one of its herbicides might be carcinogenic, and ongoing debates about genetically modified organisms kept some investors nervous. Nevertheless, demand for Monsanto's products remained strong, and despite seeing some smaller ups and downs, the stock has produced good long-term returns. What's next for Monsanto from here? Right now, Monsanto's future is uncertain for another reason: it has negotiated a merger with German giant Bayer. If the deal goes through, Bayer will pay Monsanto shareholders $128 per share in cash. Yet even though the companies expect the deal to close by the end of next year, Monsanto stock currently trades at a 17% discount to the proposed acquisition price. That indicates plenty of uncertainty about whether the deal will go through as proposed. With other players in the agricultural productivity space looking at combinations of their own, some fear that antitrust considerations will end up making the Monsanto-Bayer merger unworkable. Some Monsanto investors wouldn't have any problem with the merger falling apart. Given the company's history of making the most of its innovations, Monsanto has plenty of growth potential going forward. Although it's exposed to the persistent fluctuations of crop prices in the commodities markets and their effect on the capacity of its customers to buy its products, Monsanto has the internal resources in place to keep moving forward with new products that should help farmers feed an ever-rising world population in the years and decades to come.